A French cleat is not only a strong anchor point, but it also makes for a great organization solution. 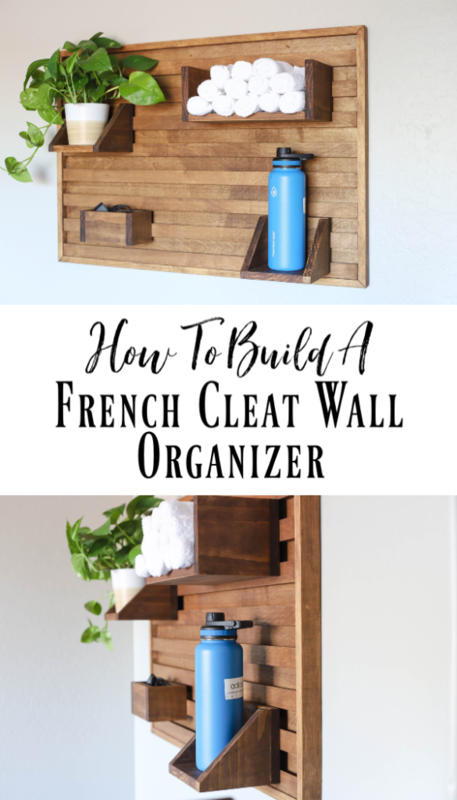 Learn how to build a French cleat wall organizer like this to organize your office, tools, or even your home gym. Almost two years ago, I took a huge leap and invested in a Peloton bike. I absolutely love my bike and the ability to work out from the comfort of home. For a while, I had my bike out in the great room of our house, but decided it would be better suited in my office. 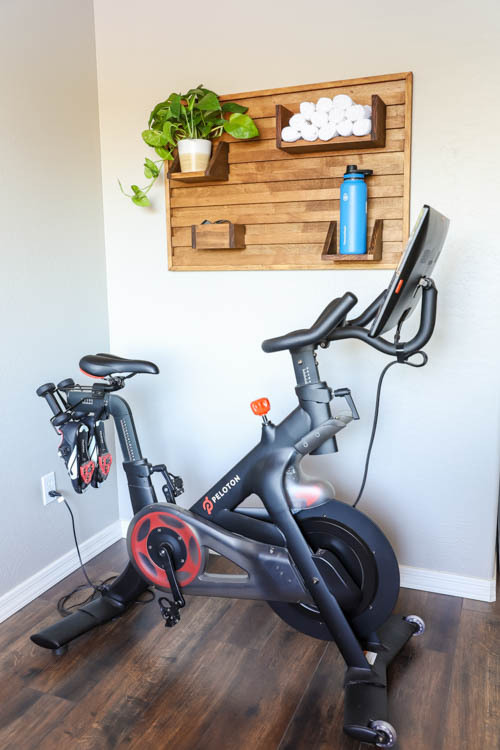 Since moving it into my office, I’d been trying to come up with ways to keep my water bottle nearby when I’m riding, and also a place to store my heart rate monitor and ear buds. Plus, I was getting a little tired of clipping in, only to realize I’d forgotten my towel. 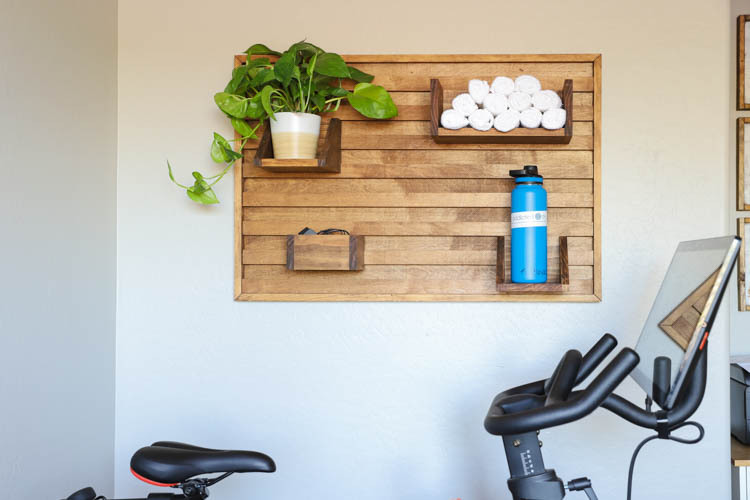 I came up with this French cleat wall organizer to keep all of my workout necessities organized in one place, AND it looks like wall art! 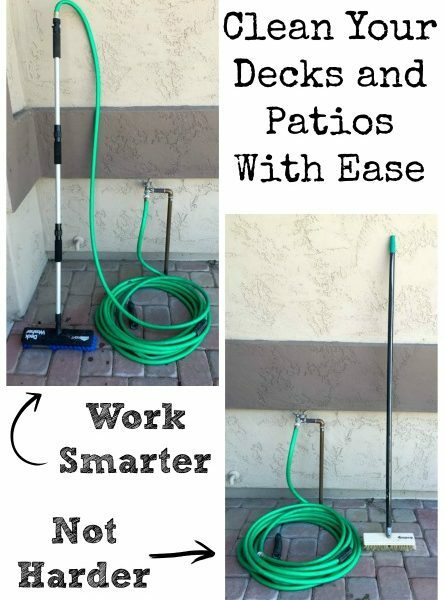 I love projects that pull double duty. 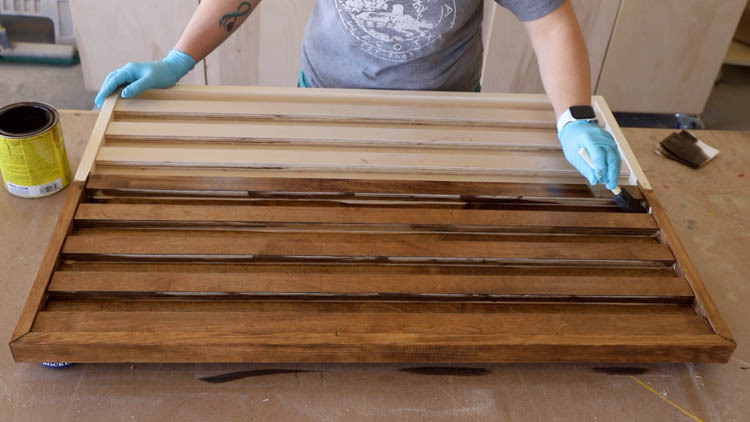 If you remember, last month I kicked off a monthly DIY challenge with a bunch of my blogging friends. This month’s theme is DIY organization. Nineteen of us are joining together to bring you our organization projects and tutorials to help inspire you and your own organization goals. I’m linking to all of the projects in this challenge at the end of this post, so make sure you stop over and visit everyone! Watch the video above to see how I built this project. 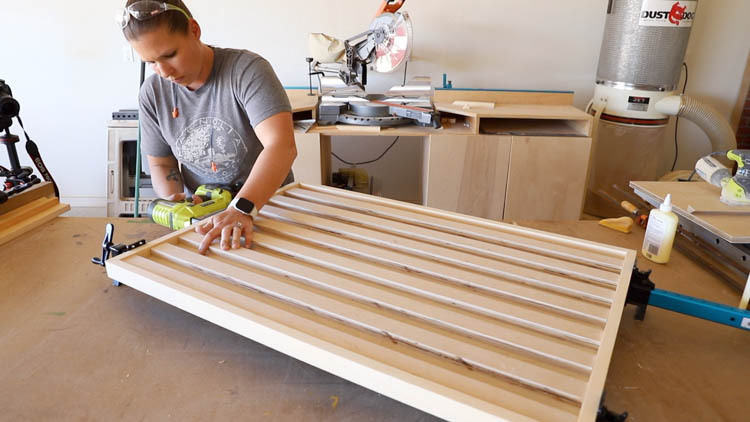 I’ve also put together a step by step tutorial as well as printable plans showing you how I built this DIY French cleat wall organizer. You can download the printable plans HERE. 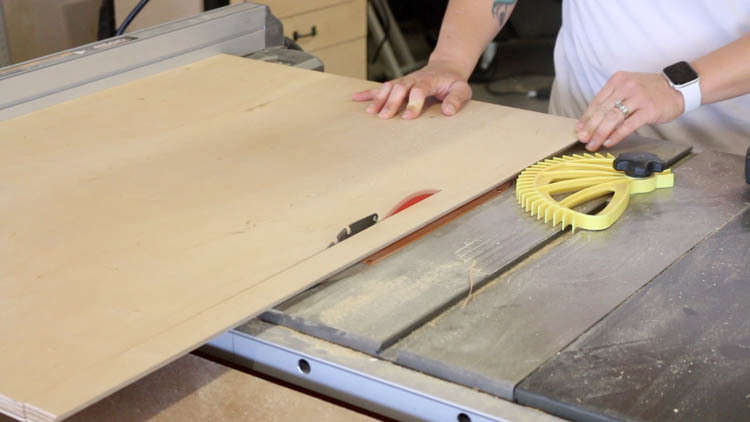 I cut 3/4″ plywood down to size on my table saw. I have quite the stockpile of leftover plywood from various projects, so I was able to use scraps for this. 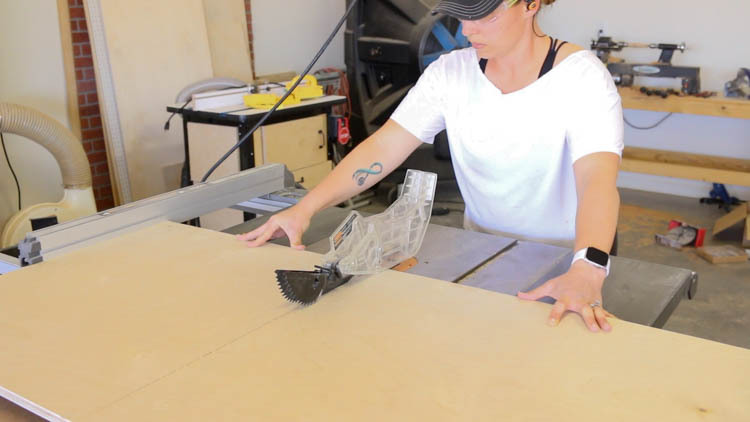 You can find all of the materials needed and cut list in the printable plans. 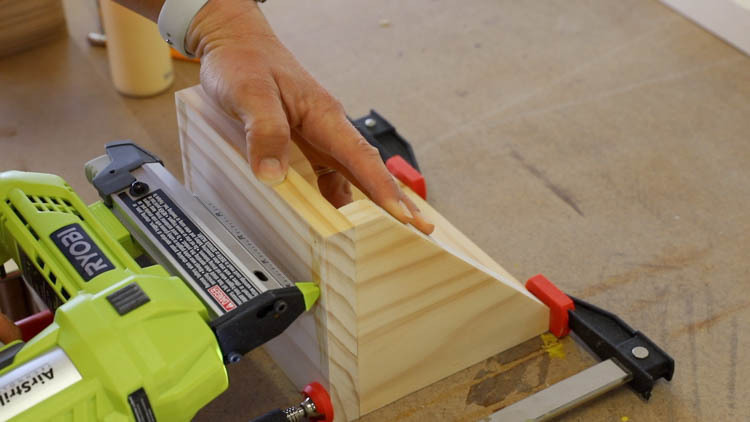 There’s several different ways you can cut French cleats. 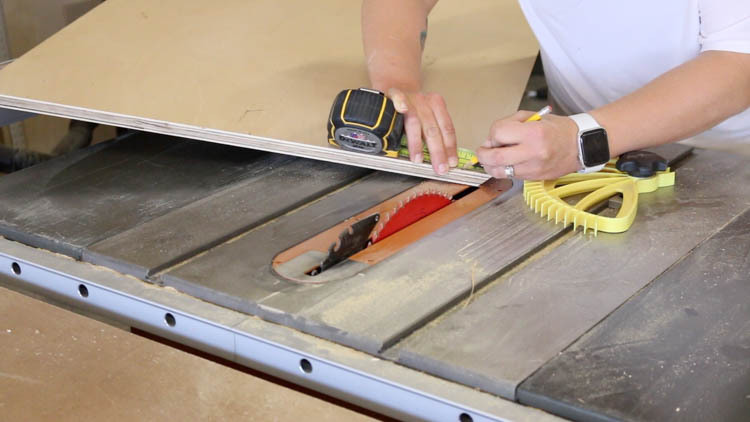 For me, I found the easiest way to do this was to tilt my table saw blade at 45 degrees and rip one edge down. I’d then mark the width of my cleat (1 1/2″) and turn the blade back to 90 degrees. Once I lined up the mark on my plywood, I’d rip down the cleats. This method does take a bit longer, but given how narrow the cleats are, it felt safer to me to follow these steps. This project only requires 8 cleats, plus one more at 1 1/4″ for the organizers that hang on the wall system. Once all of my cleats were ripped to size and cut down to length, I glued and nailed them to the plywood backing. 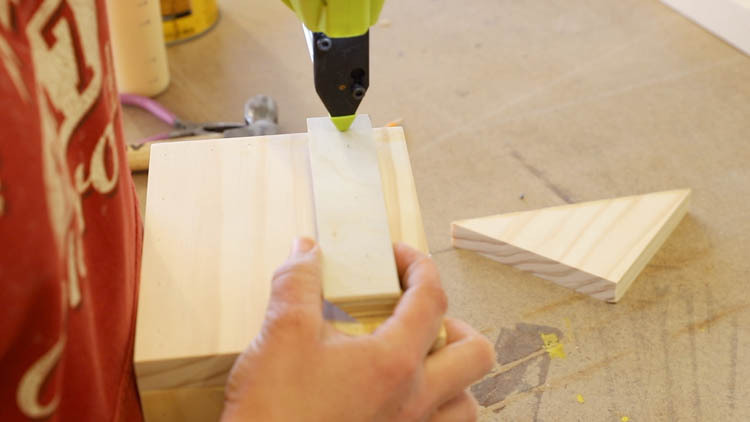 I started by lining the bottom cleat up flush with the bottom edge of the plywood. Once that cleat was secured with glue and nails, I used a piece of 1 1/2″ wide scrap wood as a spacer and continued attaching the remaining cleats. I used a pin nailer for this, but a brad nailer would also work. 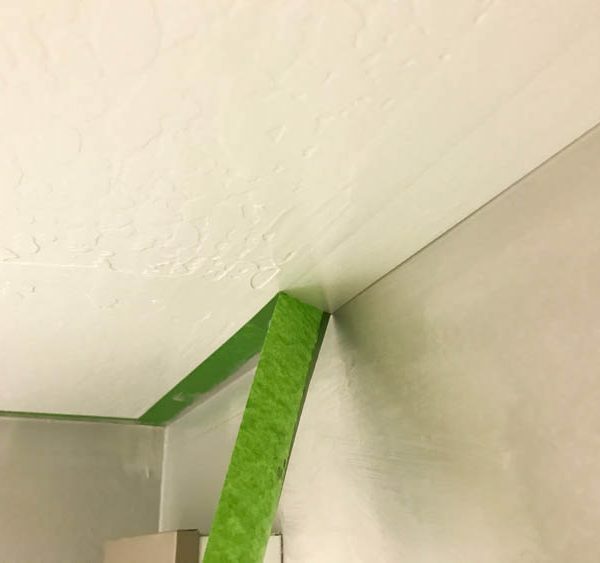 You’ll just have to fill the holes when you’re done. To finish off the organizer, I attached a 1×2 frame around all four sides. I again used wood glue and 1 1/4″ pin nails to attach it. The French cleat wall organizer can be stained, painted, or even left natural. The sky’s the limit when it comes to your tastes and styles. I chose to finish mine in special walnut to match the rest of the furniture in my office and I love how it looks against the gray walls! Another big want for me was a place to store rolled towels. I always hate when I get on the bike and then realize I have to get off, hobble through the house in my bike shoes, and grab a towel. Now I can hold a dozen or so within arm’s reach. I also built an organizer to hold my heart rate monitor and ear buds, which I’ve included in the printable plans. I could not be happier with how this French cleat wall organizer turned out! I love when a vision comes to life! It’s both functional organization with a dash of style. The organizers can be customized in any number of ways to make this work for whatever your need may be. Even the size of it can be changed up to go even bigger, or scale it down. Whatever suits your needs best! 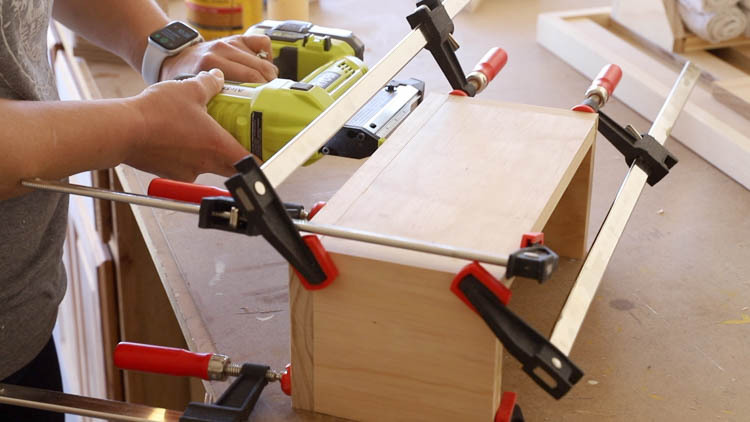 Just use the printable plans as your guide and customize it any way you like. Now that you’ve looked over my project, I’d love for you to stop by and visit the other bloggers participating in this challenge! 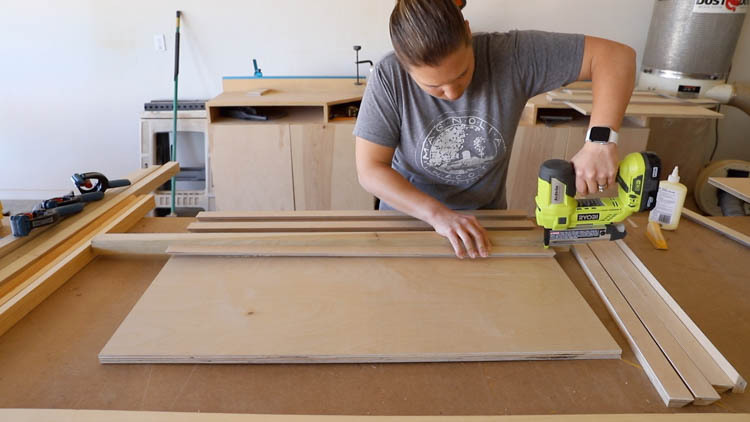 They’ve all put together their own DIY organization project tutorials and you’ll definitely not want to miss them! 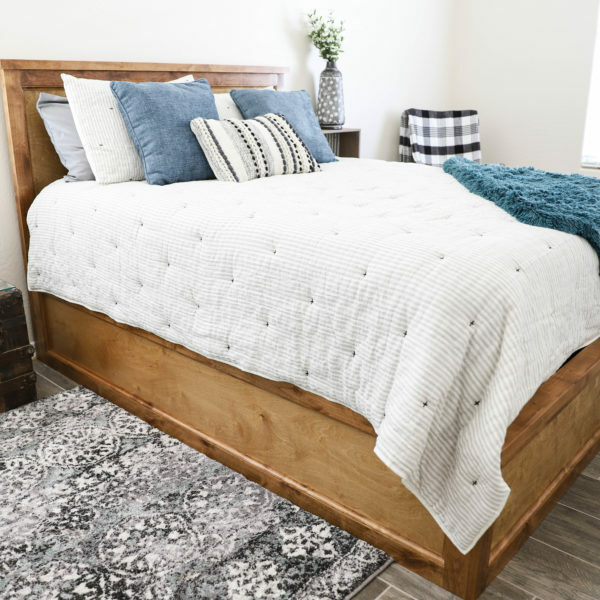 I love this–and could see it working well in so many different rooms of the house! Katie this is sooooo clever! I need an entire room, floor to ceiling of french cleats! Lol! Looks just as great as it works! You knocked it out of the park with this one! Haha! Honestly, I feel the same way! I could seriously use this everywhere! Oh, I love this, Katie! Not only is it functional, but it looks beautiful too! Thanks for joining in on the fun! Amazing! I’ve seen these for the workshop but it is absolutely genius of you to clean it up and give it a gorgeous modern look to use inside! LOVE IT! Thank you so much, Sheri! I’ve seen them the same way and they’re so useful in so many ways. Katie it’s beautiful and so functional! Love the different size bins and movable capabilities. Thank you, Jaime! I really think I need to make more of these in various sizes. There’s so many places where this would work for organization! 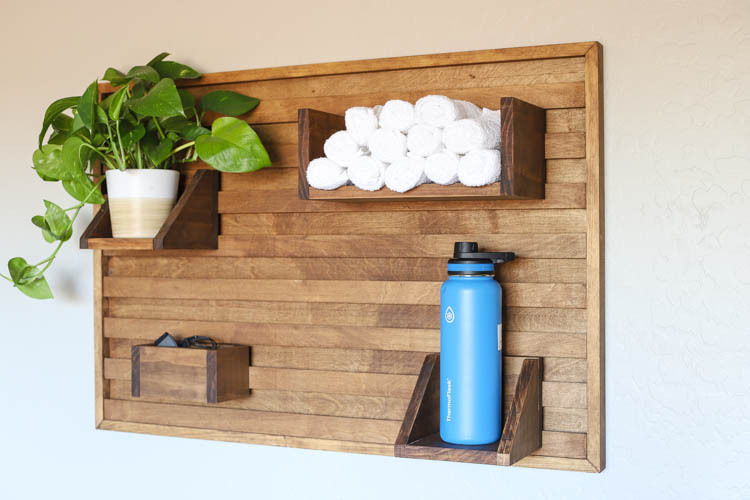 I love that you took the workshop staple and turned into such a cool organizer for any room! Oh the possibilities! Ok seriously, this organizer is SO COOL! I love that it’s super customizable based on what you want to store and you can always swap out the shelves or storage units for other things with the nifty french cleat design. Great project! Katie, this is so pretty!! And I like that it can be customized to whatever you want to store/display there! Amazing wall idea! I like very much the towels!